Many SCP Servers are made for Windows Operating Systems but the MacOS SCP server is a great free option that comes with a MacOS. It does not offer a lot of functionality or features but if you need to transfer files securely, it will get the job done. 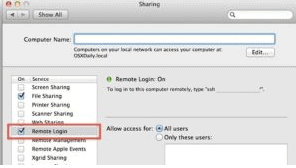 To enable SSH on the MacOS, go to System Preferences -> Sharing Applet, and click the checkbox next to Remote Login to enable the SSH server for all system users. There is no configuration necessary, existing account permissions will control what actions the user can take when connected.